We had a fantastic lunch at Acorn. We tried 7 dishes in total and we were very impressed. The presentation was beautiful and the flavour combinations were simply amazing. 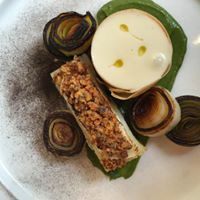 The best dish was the "Rich mushroom parfait, celeriac cooked in its own juice, hazelnut, potato, chicory" - would definitely buy that again. The only one we probably wouldn't buy again was the "Quince with walnut sorbet and coffee glazed salsify" - it's more of a personal preference, really; we just expected something sweeter for dessert and that was more neutral/savoury. The staff was friendly and skilled and they gave us a detailed explanation about the dishes. My partner gave a 4 star only for service because the glasses and cutlery weren't spotless as you'd expect from a Michelin star restaurant, but there's nothing else to criticise, really. It was probably the best vegan culinary experience I had in my life. Gorgeous food and the service was brilliant  felt very taken care of. Absolutely delicious lunch - innovative and full of flavour. Service was attentive and friendly. Highly recommended. Fabulous vegetarian restaurant in the heart of Bath. Delicious food with lots of flavour and fantastic service. 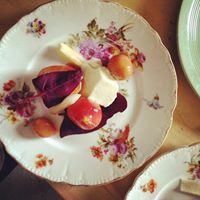 Innovative, beautifully presented food that is also absolutely delicious, coupled with impeccable service! Lovely meal a return visit  for some; kindly accommodated our large party with babes! So atmosphere was a bit odd for us downstairs by the very cheery kitchen. Food was absolutely sublime - one of the best vegan meals we have ever had. Thank you so much. Wonderful meal! I almost cancelled because I thought it was vegetarian and not vegan. So glad I didn't. I was stunned at the depth of flavour achieved with the cooking - everything was delicious and presented beautifully. Highly recommended. There were two of us for lunch. The starter were delicious. My main course was good but the cauliflower dish was shocking. It was three lumps of very undercooked, very under seasoned cauliflower. It had no flavour and I thought was poorly thought out and badly executed. It was a shame because it ruined the rest of the meal. I wouldn't go back on the basis that if you only have three main courses, they should all be brilliant. The staff were great and the service was good. Thank you for adding a candle to my son’s dessert for his birthday. The food was incredible! Sometimes the gap between courses was long but that made us appreciate the next course all the more. I was glad that the neighbouring tables were not noisy as the restaurant is small. Excellent wine pairings. Will definitely return. A flagship restaurant for plant-based eating. 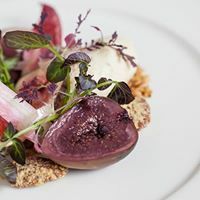 The food and service are always exceptional at Acorn. Visited Acorn when away for our anniversary, my girlfriend is a huge fan of plant based food so this was ideal, she had eaten here before and it definitely lived up to the exceptions she had set. 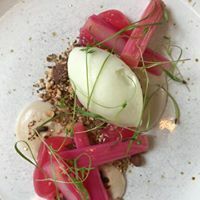 I wish we had, had the time to go for the tasting menu as I can see this being great value for money, I really enjoyed the mushroom Parfait, I will definitely be returning when I am back in bath! Delicious! Such a veggie treat. A wonderful evening with fantastic food and service. Thank you! Wonderful food and service. Only issue was that the service was a little slow, it took almost 3 hours for the 5 course tasting menu. This was the best meal (5 course tasting menu) that I have ever had. I have told everyone I have spoken to and will be coming back to Acorn in June. Quality of food was excellent, however the price was very high, with portion size lacking. I left having two courses still a little hungry, and with my pocket nearly £100 lighter for me and my partners meal and drinks I found it quite disappointing. Also I would suggest the front of the restaurant not be used for seating as it feels more like a thoroughfare than a dining room. Recently rated 11th from the 50th best vegan friendly restaurants in the world. It deserves that place in the ranking. Friendly atmosphere, nice staff and unbelievable tasty food presented in a beautiful way. An interesting concept, and proof that vegan dining can be high end and a treat. The restaurant itself is gorgeous and the wine list was excellent. The food was beautifully presented and very flavoursome; not every dish worked (in fact, the simpler ones that didn't try to be a "meat.fish substitute" were the most successful, we thought) but all were interesting.